Guru Pooja and Sandhya Aarti at Sri Sri Krishna Balaram Mandir in the holy city of Vrindavan will be streamed live in 360degree Virtual Reality(VR) via VR DEVOTEE App on 28th of April 2018. Devotees from all over the world will be able to chant prayers and sing keerthanas along with the thousands of pilgrims at ISKCON VRINDAVAN. Developed by Kalpnik Technologies, a start-up leveraging VR and AR technology, VR DEVOTEE is transforming the way people connect with their faith. Devotees from across the globe who are unable to visit ISKCON Vrindavan Temple will now get an opportunity to Indulge in The Bhakti of Lord Krishna and Lord Balarama Through VR DEVOTEE APP In 360 Virtual Reality from the comfort of their home. The Puja and Aarti experienced using a VR Headset is truly immersive giving one the experience of almost being there at the temple. 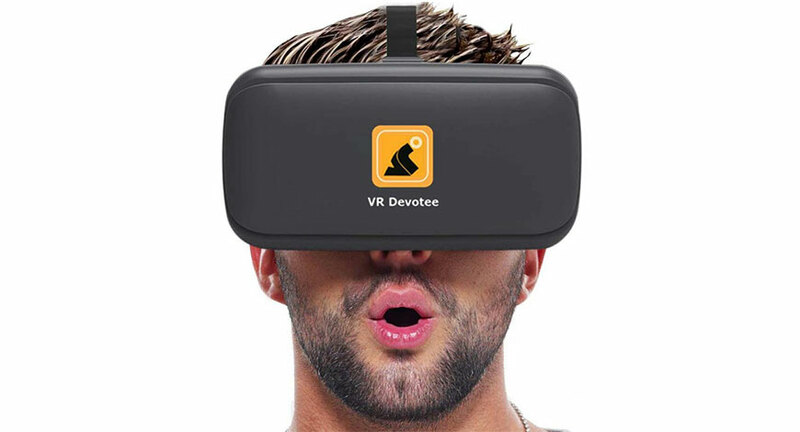 VR DEVOTEE, enables users to have a full 360-degree view in virtual reality, giving the them an immersive experience, which is almost as good as being there. VR DEVOTEE App is a godsent opportunity for all who are unable to visit ISKCON Vrindavan Temple due to geographical constraints, old age, ill-health, financial restrains or any other reason. VR DEVOTEE App is available free for download on Google Playstore and Apple App Store. To best experience the Aartis in a manner as if you are there at the temple you can buy a VR DEVOTEE headset at a highly discounted rate from www.vrdevotee.com. Or if you already have any VR Headset please use the same for a truly immersive experience. The 360 experience can also be got on your mobile phone. The company’s App VR Devotee was launched on January 25th, 2018 and since then has streamed live events like Mahamathakabhisheka (Shravanabelagola), Amavasya at Cheruvugattu Temple, Pushya Abhishek (ISKCON Chowpatty), Sri Sai Baba (Sai Spiritual centre Bangalore), Krishan Matha (Uduppi), Hanuman Jayanti from Karmanghat (Hyderabad) to name a few. Ashwani Garg– CEO & Co Founder of Kalpnik Technologies Pvt. Ltd said “live streaming for Devotees to experience Real Time Immersive Aartis and Pujas is now become an integral part of our Offerings with more and more devotees seeking this immersive experience. We are doing 2 live VR 360 streaming every month and the response has been highly encouraging. The company within a short span of 3 months has 360 VR content from 23 temples and Spiritual leaders and is confident that by the end of the year will have close to 100 temples Pujas and Aartis on its App VR DEVOTEE. VR DEVOTEE has received extremely good feedback from devotees from across the world with over 125,000 app installs in just under 3 months since its launch. Majority of our customers are experiencing the Aartis and Pujas on their mobile phones and many requests have come in for the company to launch good quality headsets are affordable prices. What is encouraging for us is that the Temples are adopting digitization to engage deeper with their Devotees and are sharing the message with their Bhakts." The company will shortly be launching good quality VR Headsets at under Rs 200 to enable devotees to get a truly immersive experience. Millions of Devotees across the world are currently watching Live telecast of Aartis and Pujas on their Television screens but using a VR headset the experience is as if the Devotee is in front of their deity, inside the temple. Kalpnik spent over 18 months in developing a very user-friendly APP and VR headset that delivers a highly immersive experience for Devotees. The experience is almost as good as physically being there. A large number of ISKCON devotees reside outside India and for them live streaming of Guru Pooja and Sandhya Aarti at ISKCON Vrindavan is a great opportunity to engage deeper with their faith from anywhere in the world. Kalpnik has already produced VR experiences for several well-known temples and Spiritual leaders in India”.